Ever wondered where people originally came up with descriptions of fantastic creatures like goblins, faeries, and others? I’d suggest that many of these creatures came about as people tried to describe creatures from far-away lands, many of the creatures being so rare that it would be difficult to ever see them in one person’s lifetime. That is, difficult to see these creatures before the creation of the Internet. 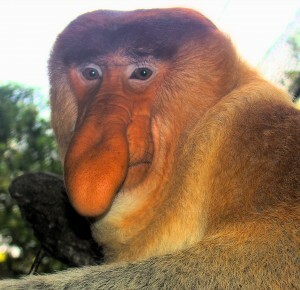 It’s easy to see how goblins could have arisen as people tried to describe a creature like the Proboscis Monkey. Goblins are typically characterized by having a large meaty nose, long claws, and being somewhere between the size of dwarves and humans. Proboscis monkeys share all three of these characteristics. Proboscis monkeys also live in swamplands and forests–goblins are believed to live in mossy cracks, caves, and tree roots. Both goblins and Proboscis monkeys are nomadic, never staying too long in the same place. Are these similarities a coincidence? Perhaps, but that makes for a less interesting story. In a lot of ways, I’d prefer thinking that the goblins in some of my favorite stories had a basis in a real creature. These small creatures only grow to be five to six inches tall (excluding the tail), and are the perfect size for faeries. They’re also known for living in the rainforests of Brazil, as well as other areas of South America (not bad, considering that many faeries are also rumored to live in forests). 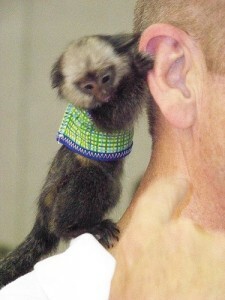 It would not be too hard to believe that creatures like the Pygmy Marmosets inspired some of the original tales of faeries. Pygmy Marmosets may not look exactly like faeries, but, as they scamper by in a nearby tree, it would not be hard to imagine that someone who didn’t know any better would mistake them for a faerie. Of course, since these specific creatures live in South America, the likelihood of them influencing Celtic legends are slim–Europeans would have needed to travel to South America hundreds of years prior to the start of these legends. However, there are similarly small species in Africa (such as the Talapoin), which could work just as well as inspiration for similar tales (no pun intended, of course). There’s also the possibility that squirrels dashing through the trees could have been part of the inspiration for woodland faeries–if all you got was a quick glance, it would be easy to mistake a squirrel for a small person running up a tree. Pygmy Marmosets are known both for being common–they’re classified as Least Concern as far as the threat of them being endangered–and for being fast. It’s very easy to see how someone in the rainforest could hear, or even see, very small “people” running through the trees. What do you think? What other explanations can you think of for the creatures told in stories? Are these similar, real-life creatures just coincidences? Each week, we post a writing prompt in the forum. Friday blog posts are dedicated to showcasing the best responses to the weekly writing prompt. This weekâ€™s prompt was: A telephone rings. We post a new prompt each Sunday, and pick the best prompts to be shared on Friday morning. All we ask is for you to spend 15-30 minutes on your prompt, so get ready for the next challenge on this coming Sunday! Please check out the responses to our writing prompt challenge! There were several high quality, enjoyable responses. Leave comments on your favorites!